We know a lot of Lord Rama and his family through various versions of Ramayana. The most famous (and considered authentic) two versions of Ramayana are (1) Ancient Valmiki Ramayana and (2)Saint Tulsidas’ Ramayana. Lord Rama (aka Ram) is an ideal human being and his character is dignified and glorified as “Maryada Purushottama”. There are many Film/TV Series adaptations were presented by various makers showing their own vision of Ramayana. Needless to say that the most popular TV Series was Ramanand Sagar’s Ramayana. Pt. Jawaharlal Nehru also talked about the influence of Ramayana on Indian people in his well-received book, Discovery of India. The same is explored in two episodes segment of a TV Serial named Bharat Ek Khoj, which is based on the same book by Pt. Nehru. These 3 stories meet at a point, from where the fourth book will take over. It is worth to note that only 2 books in the series are released so far. Anand Neelakantan, tried to explore the tale from Ravana’s perspective. While Ravana is considered as a demon and hated for his act of abduction of Sita and other wrong doings; there are no doubts about his ability as a warrior or his devotion for Lord Shiva. His knowledge about various stuff is nonparallel. Anand’s book – Asura – Tale of the vanquished – was well received and it met with commercial success too. Anand, then decided to introduce people to the tales of Sita and Shanta, two ladies which are related to Lord Rama. He wrote a mini-book named Bhoomija – the story of Sita and Shanta – The story of Shanta (a less known sister of Rama). The book is very Short in size (just 35 pages). Let us take a look at the short and see whether it is worth to go for. While the book is pretty small, talking at a length about it will definitely include many spoilers, which I will try to keep at bay. But, some of them are unavoidable. It all starts with the childhood days of Shanta. Like most of the other societies, the ancient Indian society was also patriarchal. In the royal family of Saket (there is no word – Ayodhya mentioned for Dashrath’s Kingdom – rather it is referred as Saket) Dashrath was keen to have a son. He was married to three queens, but somehow so far Kaushlya was the only one to bear a child and she is Shanta. Despite being the first born Shanta was always ignored by his father and other family members. Shanta did found her solace in her step mother Kaikeyi and Kaikeyi’s made Manthara. Kaikeyi was very determined to make Shanta a fearless warrior and educated in management, she considers Shanta as the best (and only) contender for the throne. Destiny, however, have something else in its mind. And eventually, king of Anga came with a proposal to adopt her from Dashrath. There were two reasons for his proposal. His kingdom – Anga – was fighting drought since 12 consecutive years, and he did his best to give solace to his citizens. Now he remains with no choice, but somehow bring Rishyashringa to his kingdom and have a devotional ritual to be performed under his leadership to make Indra (the God of rains) happy and get his kingdom out of this tough situations. How can Shanta help him in that? Well, that is to explore in the book. And yes, as I said, there were two reasons behind his proposal. So, the second reason might be something which is found interesting by Dashrath himself! Why otherwise, he did agree with the proposal of King of Anga? I leave it for you to explore by reading this short (book). while the canvas of the book is short and the story of Ramayana is almost well known to the readers, there is a very little for Anand to explore here right? Actually, the story of Shanta is less explored and unknown to many, and that is the author’s masterstroke here. 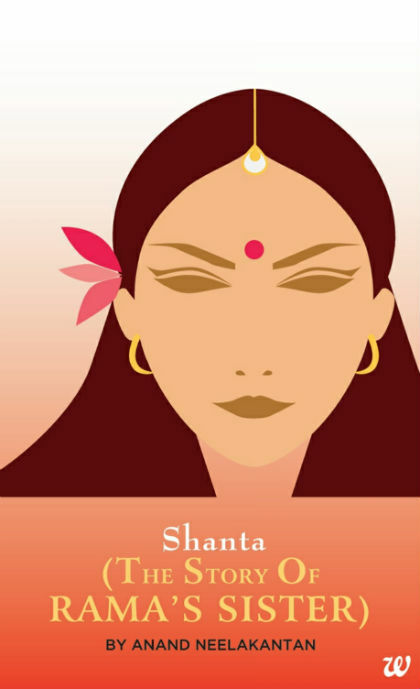 Most of the readers will find reading something new when reading the story of Shanta. The traditional patriarchal society and its norms are explored effectively and convincingly by Anand. His grip of vocabulary is getting stronger by each of his books, and this book is evident of the same. What I like is the characterization of almost every character in the book. The characters and their attributes are explored so nicely that on one hand you find them coming from our day to day life, and on the other, from the mythology. Shanta’s character is the strongest, of course. Kaikeyi’s character is explored well too. Her character shows that how the environment in which one grows up defines one’s character. She is fearless and self-dependent. While he respects the rights of the king, she is bold to express her opinion. He unconditional love for Shanta is something nice to explore. Even Manthara’s character is not evil here. Kaushlya is living a life of a devotee and her main concerns are worship of God and her aim was to give her husband a son. Sumitra, being youngest of them is beautiful and king loves to spend maximum of his time with her, and she doesn’t fail a chance to show her influence on King. All these things are written quite nicely. Unlike the towering pillars of her father’s palace that seemed to stoop under the burden of centuries old traditions, and cast black shadows, even darker than a moonless night on her mind, here everything was iridescent and expansive. Her stepmother had hugged her close and said, never mind what the men say. In this world, no man has the courage to equal the pain a mother faces while giving birth; no amount of valour can ever equal that. The greatest vidya is living, kumara. The greatest miracle is life. I have decided to end the selfish pursuit of attaining moksha and embrace life as a nature has intended us to do. Diamonds are only ornamental, it is in mud that the lotus blooms. Bless us, Father. Happiness has to take root within, and nurtured with belief and love. … won’t it be a sweet irony that it needed his daughter to fulfil his desperate need for a son? The book is all about love, dedication, truthfulness and finding the aim of the life and to live it for the betterment of ourselves and others too. The cover page of the book is not very attractive, it could have been better to create an impact on the buyers. I am not talking about the characters of Rishyashringa and some others, intentionally, as it will otherwise reveal almost everything. Overall, the pace of the book is good throughout and the writing is flawless. At the end, the reader will feel that the story could have been explored in more detail. Readers will find the book a little pricey (INR 25 for 35 pages). The book is definitely very good if you want to explore the character of Shanta, a lesser known character in Ramayana. A detailed version of the book is expected. A set of readers may find it pricey too. In literary aspects, the book is good.